order Krista’s #1 New Release in Crystals, and Energy Healing, and as a thank you Claim 4 special bonus gifts Valued at over $150! You’ll get two mini-courses, a guided meditation, a crystal reiki room grid .pdf + specialized crystal reiki index - all additional and exclusive content available only to people who order “Crystal Reiki”! Scroll down for instructions on how to receive your free gifts. Two popular practices—crystal and energy healing—in one great, expert handbook! 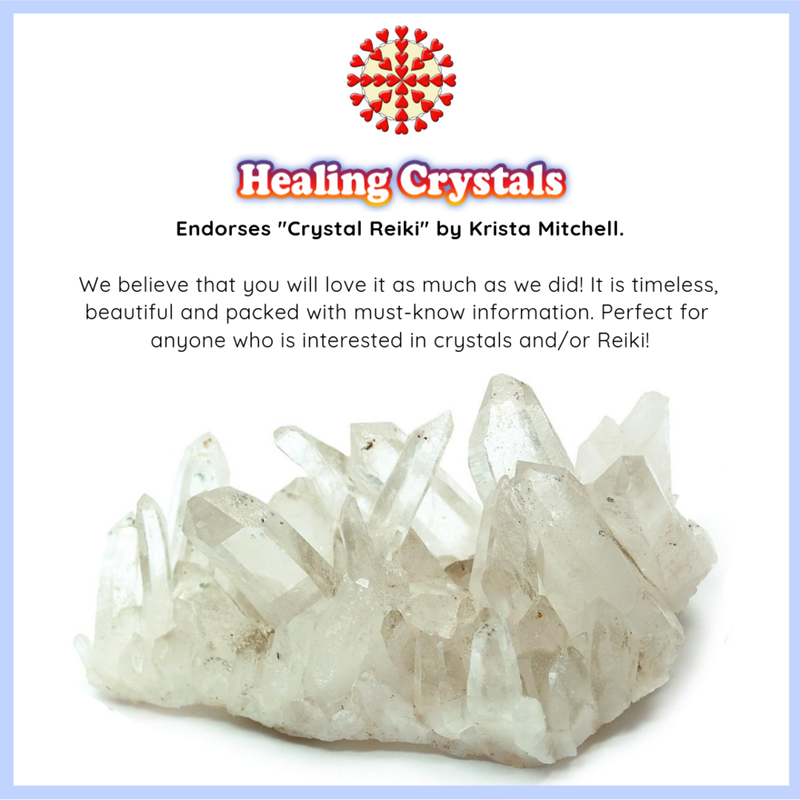 Krista Mitchell (Change Your Energy) is a master at crystal healing, and with Crystal Reiki, she has created a handbook for practitioners both amateur and professional. This technique combines crystal layouts with energy healing to treat a variety of ailments. Fully illustrated and easy to use, this comprehensive guide teaches the fundamentals of working with crystals and chakras; explains how healers should prepare themselves, their space, and their tools; covers four levels of healing that include auras, body, mind, and spirit; and stresses the importance of self-care for healers themselves. Krista’s story plus real-life case studies and anecdotes! Purchase your copy of “Crystal Reiki” from your fave online or offline retailer by January 31st, 2019. Click on the link or copy/paste into your browser. You will be shown the link to claim your gifts after you hit the submit button. You will also receive a thank you email with the link in a short while. If you require any assistance please email us and we will be happy to help you! For energy healers, the risk of negative transference (ie: passing lower energy between people) is high. Healers need to be able to shield themselves from this risk, but in a way that allows them to remain open, emotionally available, and in tune with their clients. In this 30 minute video course, Krista guides you step by step through the technique of channeling specific frequencies from five different crystals (smoky quartz, tourmaline quartz, black tourmaline, rose quartz, and jet) to help ground, clear, protect, and fill your aura with loving vibrations. With this technique, you’ll be able to effectively shield your aura and reduce the risk of transference in your healing work. Based on her experiences as a full-time crystal healer in the heart of New York City, Krista shares with you how she used crystals to grid her healing room to help hold, shield, and purify the energy of her space. You’ll be happy to learn that you don’t need a huge number of expensive or hard to find crystals to replicate this grid in your own space! Krista keeps it real, simple, and shows you step by step how to set up the same grid that was road-tested and successful in her own healing practice. In addition, you get a copy of Krista’s Crystal Reiki Room Grid map to download and follow for easy set up! In Crystal Reiki, Krista emphasizes the importance of both grounding and centering your energy before any psychic, healing, or spiritual work, in order to stay empowered and accurately intuitive in your work. While she describes the exercises in detail in the book, she’s created this additional bonus meditation to help guide you through the exercises in an uplifted state of relaxation. This 9-minute meditation .mp3 will leave you feeling grounded, centered, in tune with your intuitive guidance, and shielded. The Crystal Reiki Room Grid Map can be used after watching the mini-course to help you build your grid in your own healing, meditation, or sacred space. The Reiki Amplifying Crystal Index identifies specific crystals you can wear or add to your space to naturally channel healing energy, increase your connection to spirit guides and higher realms, amplify reiki healing energy, and increase your intuition! "Krista shares a wealth of knowledge and practical guidance for Reiki practitioners and Crystal Healers. Crystal Reiki is packed full of tools and complete procedures for spiritual, mental, emotional and physical healing based on real-life experience. Krista has written an excellent comprehensive guide and reference for modern-day energy healers. Crystal Reiki includes powerful crystal layouts to take your Reiki sessions to another level!" “Krista Mitchell is a master energy healer. Her integration of Reiki and Crystal work is at the cutting edge of energy healing possibilities. This amazing book Crystal Reiki takes you not only through specific healing layouts, but also teaches how to shield, create a healing space, and more. Perhaps most importantly this book teaches how to recognize our own shadow, something many energy healers avoid. I highly recommend this book.” - Brett Bevell, Author of Psychic Reiki, The Wizards Guide To Energy Healing, and other books. “Wow! Adding Crystals to your Reiki Practice couldn’t be made easier! If you’re looking to deepen your knowledge of crystals, and feel ready to start a new healing journey, Krista Mitchell is the crystal healing teacher for you! We've taking Krista's workshops, watched many of her videos, and her book, Change Your Energy is our best selling crystal book at Happy Soul! “Being a healer is a noble calling." Thus begins Crystal Reiki: A Handbook for Healing Mind, Body, and Soul by ‘Rock Whisperer’ Krista Mitchell. In Crystal Reiki, the follow-up to her bestselling crystal guide Change Your Energy, Mitchell provides a groundbreaking guide to the art of Crystal Reiki. Developed over fifteen years and thousands of professional Crystal Reiki sessions, Mitchell discovered how to combine the best healing properties of both crystals and Reiki to accelerate her clients' healing process and to better address their needs. In this beautifully illustrated guide, Mitchell carefully and thoughtfully walks you through how to integrate Crystal Reiki into your own healing practice, including the fundamentals, preparation and specific practices. Mitchell then goes an important step further by including a section on an often-discussed and little-addressed issue for healers: how can you best heal your clients’ deepest needs while still taking care of your own? In this section on self-care, she provides specific guidance that includes weekly restorative practices and crystal self-healing layouts.